AfriCook Culinary Competition Winners | Breedlove Foods, Inc.
Mahlet Meles placed third with her Ethiopian food consisting of breads called Injera and Ambasha, two hearty beef dishes called Alecha Wet and Minchet Abish, along with a spicy chicken soup called Doro Wet—one of the most famous and recognizable dishes in Ethiopia. Traditionally, the food is eaten with the fingers by tearing off a piece of Injera and dipping it in the verities of Wat. For placing third, Meles was awarded $100. Presenting her native cuisine from Guinea, Mariame Conde finished second place serving a mouthwatering dish called Attiéké, consisting of grilled fish, tomatoes, cucumbers and various other vegetables and spices. Attiéké originated from Côte d'Ivoire but has also become popular in other countries in West Africa. For placing second, Conde was awarded $200. Serving up more delicious, Ethiopian cuisine, Mengesha R. Endalew placed first overall. Mengesha prepared several lentil soup varieties called Meser and Meser Alcha, and a dry pea soup called Shero, which are all served with pieces of Injera bread with spices called Suf Fitfit. Along with soups, two beef dishes were presented called Gomen Be Sega, which is served with Ethiopian cabbage, as well as a spiced meat meal dish called Sega Wat. To top everything off, the traditional chicken meal Dero Wat was served. For placing first, Endalew was awarded $500, as well as a paid internship with Breedlove Foods for the summer of 2016. Because of the rapidly changing, increasingly interdependent world and global marketplace, Texas Tech University strives to maximize educational opportunities for the persons it serves in order that we all might become more knowledgeable of other countries and peoples, appreciative of cultural diversity, and capable of functioning as internationally competent individuals. 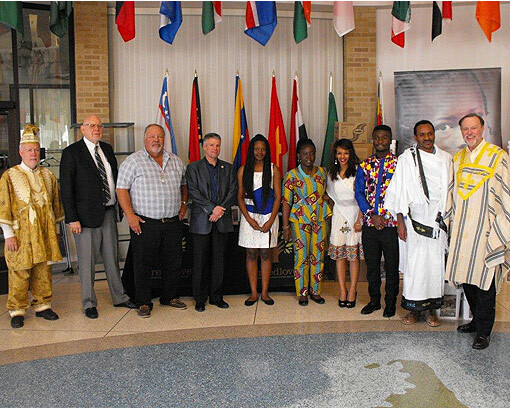 The Office of International Affairs (OIA) and the International Cultural Center (ICC) provide a myriad of far-reaching services for TTU and the multiple and diverse communities served by the University. In addition to the main office, International Affairs also consists of the following divisions: International Education and Enrollment Management, International Research and Development, International Operations and Outreach, International Student and Scholar Services, and Vietnam Center.